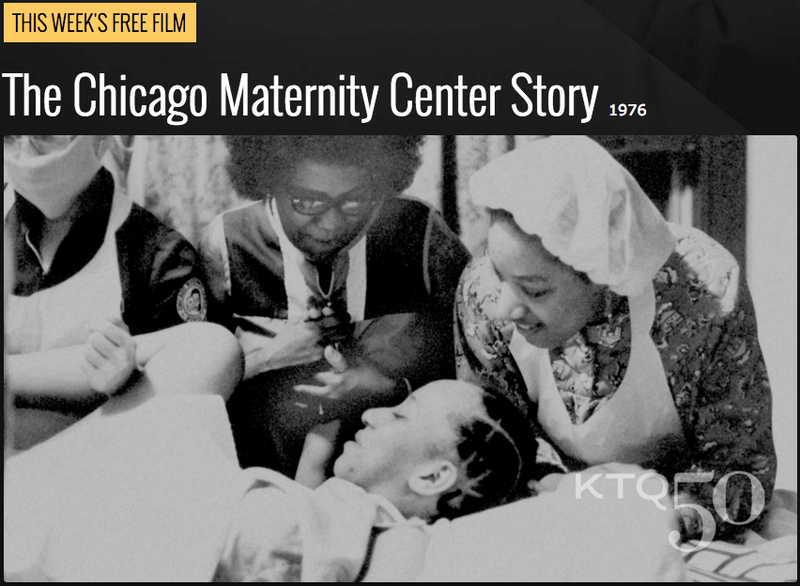 From today until next Friday, April 15th, the free KTQ50 film is The Chicago Maternity Center (1976). For more than 75 years, The Chicago Maternity Center provided safe home deliveries for Chicago mothers. This film interweaves the history of the center with the stories of a young woman about to have her first baby and the center's fight to stay open in the face of the corporate takeover of medicine. A classic feminist documentary, The Chicago Maternity Center Story was produced by Chicago's historic Kartemquin Collective, self-distributed and screened. The film has made worldwide appearances starting in its hometown at the Chicago International Film Festival in 1977 to screening at the Berlin Film Festival in 1978 and is currently at the Ashland Film Festival in Oregon from April 7th through April 11th as part of a program honoring Kartemquin's 50th Anniversary in a series featuring films directed by and about women. The film is a must-see for anyone who is interested in the history of childbirth, public health, and the medicalization of the female condition. - PHOTO of Betsy Martens, an original Kartemquin Collective-era member, during The Chicago Maternity Center Story shoot. - PHOTO of the Chicago Maternity Center front entrance. - Chicago Maternity Center Brochure. A brochure used to advertise the 16mm film in the mid-late 1970s. - ARTICLE by Cineaste. In 1975, the Kartemquin Films Collective was interviewed for Cineaste, "the leading magazine on the art and politics of the cinema." The interview took place during the filming of The Chicago Maternity Center Story, which receives a mention, amongst a wealth of rich Chicago filmmaking history from the Collective-era members: Jerry Blumenthal, Vicki Cooper, Suzanne Davenport, Susan Delson, Judy Hoffman, Sharon Karp, Peter Kuttner, Betsy Martens, Jenny Rohrer, Gordon Quinn, and Teena Webb. The Chicago Maternity Center is available on DVD here. This DVD features a new digital transfer of the 16mm film, thanks in part to the National Film Preservation Foundation. Long time Kartemquin associate and original Collective-era member, Jenny Rohrer, talks with Director of Communications and Distribution, Tim Horsburgh, about her start with the organization back in the 1970s, what really turned her on to the power of documentary filmmaking, and what she's up to now. Intrigued by the ways in which "documentary film could really open up a reality to people who had never experienced it personally," she has continued to support and create important social-issue based work. One of her latest films, Keeping Clear Water, illustrates how local students and residents have become skilled and informed ‘citizen scientists’ with a commitment to monitor and learn about our streams and lakes. Listen to the full interview here. Our 50th Anniversary Milestones Live Event on June 24, 2016 at the Harris Theater, preceded by a Gala Dinner Reception at an exquisite private home overlooking Lake Michigan. Honorary Chair Chaz Ebert and #KTQ50Gala Committee Chair Adrianne Furniss invite you to join us in celebrating many of our filmmakers, subjects, and partners from across five decades. Funds raised will support our future efforts to create documentary films and nurture documentary filmmakers that play a vital role in the process of democracy. BUY TICKETS AND GET MORE INFORMATION. Contact Mo Johnson Mo@kartemquin.com, 773-472-4366 for sponsorship details. For media inquiries, contact Tim Horsburgh, Tim@kartemquin.com. Kartemquin at 50: Democracy through Documentary, an artifacts & ephemera exhibition at EXPO 72, Chicago, IL, featuring a curated selection of KTQ’s historical photographs, artwork, and video and film mechanics. The exhibit will open May 20, 2016 and run through August 20th. Multiple retrospectives and new screenings in Chicago and across the nation, including at the UCLA Film & TV Archive in Los Angeles for fall 2016. Contact Tim@kartemquin.com to arrange a screening.